Fatoumata descends from the Malinke and is 12 years old. She lost her mother at the age of 2 and was raised by her blind grand mother. She lives with her father, two older brothers and her grandmother all of whom are beggars. They live in the original house of their grandfather who was also a beggar at the time he was alive. 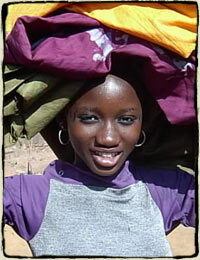 Fatoumata received from 20 cents to $1 each day and has been begging since she can remember. Everything she received begging went towards daily food for the family. Often they would go hungry or beg for leftovers from their neighbors. Fatoumata is a skilled fabric dyer and has strong sewing and beading skills. Her dream is to have full time work and become rich. This is the first time she has ever had extra money she can put away in savings which the girls are required to do each week. She will join another team of 4 to start her own business selling products to Hèrè jè Center.